Why Do I Like My Miata So Much? I think I'm slowly figuring things out. 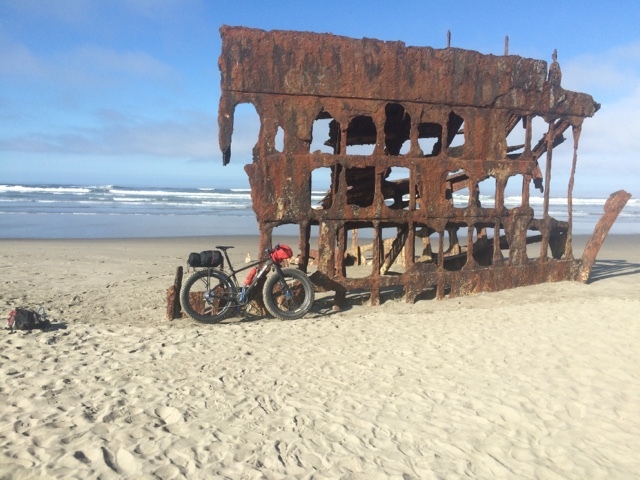 A few months ago I rode my bike from Utah to the Oregon coast to go buy back my old Miata. But my old Miata came with a bonus, a not quite as old Miata to use as parts. So for that last few months I have needed to make a second trip to Oregon to get the parts is parts car. 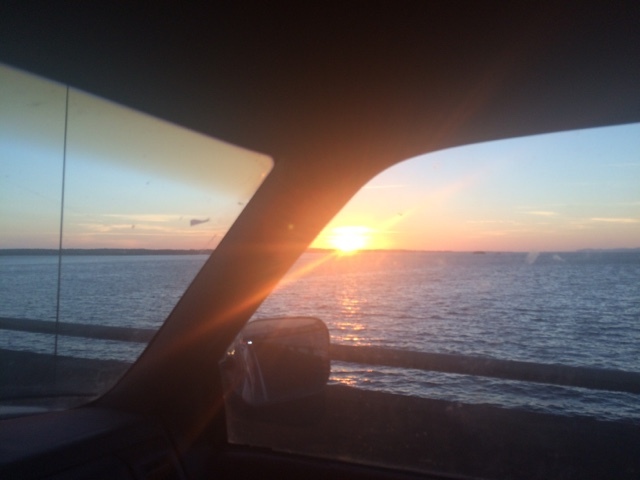 Last week I finally got in my old truck and headed out to get the car. Not long after getting into the truck I am reminded that driving is a boring activity. I'm not sure what all is involved, a creative mind that likes to be active, and a body that likes to be active, or what but I can't drive for long before I get bored and have troubles staying awake. So a little Red Bull, a little more Red Bull, and even more Red Bull and I am able to endure the 14+ hours it takes to get from my home to Astoria Oregon. First thing I notice when I get out of the truck is how jittery I am. Then a couple of nice days riding my bike and it is back to the truck. Even the couple of hours of driving down to Newport is way to long to be sitting in a truck. Then comes the true test, driving back home. With the car on a trailer behind the truck I have to drive slower, and with the nap somewhere in the middle of Oregon it ends up taking about 24 hours to get back home. Shortly after getting my Miata back the convertible top broke, making it hard to put the top up or down. Now with the spare parts car I got to work and swapped doors, fixed seatbelts, and fixed my convertible top. So today I had to go for a short drive. Putting the top down it starts out as a fun ride, but then I realized why I like don't really like driving and why the Miata is so much better. I like to be creative, I don't like to be caged in, I like freedom, freedom of expression, freedom of movement, just basically the feeling that I can do what I need to do. But in a car (or truck) your freedom is severely limited. First of all you are boxed into a little cage. Then you must stay between the lines. There are speed limits that if you get caught breaking then you have to sit around while some cop that has been trapped in his own cage takes his time to give you a fine for your attempt to enjoy the ride. But then even without the speed limits there are stop lights, stop signs, and all kinds of rules that you have to conform to. And if that was not limiting enough you are always surrounded by other cars that limit you freedom of motion. So I think the reason I like the Miata so much is that when I put the top down, to some degree I escape the cage of being in a car. It gives me a sense of freedom. I find myself swerving back and forth in-between the lines of my lane. My little bit of freedom makes me want more. And so I like the Miata. But mountain biking is even better. I am not in any kind of cage. I feel free to roam and explore. I love mountain biking. But maybe all of this factors into why I hate the rule that mountain bikes are not allowed in the Wilderness areas. Wilderness areas are set apart so that we can escape the confines of our modern world. What I love about mountain biking is also what I love about being in the Wilderness. Too bad I am not allowed to combine the two. I just love to ride my bike. Today I retraced back form Nehalem back to Astoria. Only this time I knew not to do the trail through Ecola. I knew high tide would be in the morning and I might end up waiting at Arch point. I took my time riding up the beach taking pictures and getting some video. Still when I got near arch point the tide was too high. So I hung around eating and enjoying the view. Then I decided to make my attempt. Timing in between the surges I worked my bike through the rocks. When a surge would come in I climbed up rocks to keep my feet dry. It worked well until I was about 10 feet from clearing the rocks when a big surge got me. Wet feet for the rest of the day. When I got to Hug point the waves had just gotten low enough to make it passable, but the wet rocks made it evident that not long before it would have not been passable. Other than the people not paying any attention getting through was not a problem. The return trip was easier and faster since I knew the problem areas. It was a great day that ended with a dense fog coming in off the ocean. I had an incredible day of biking. I talked to a state park beach patrol guy before I headed out. After I left he figured out who I was. He then tracked me down on the beach. 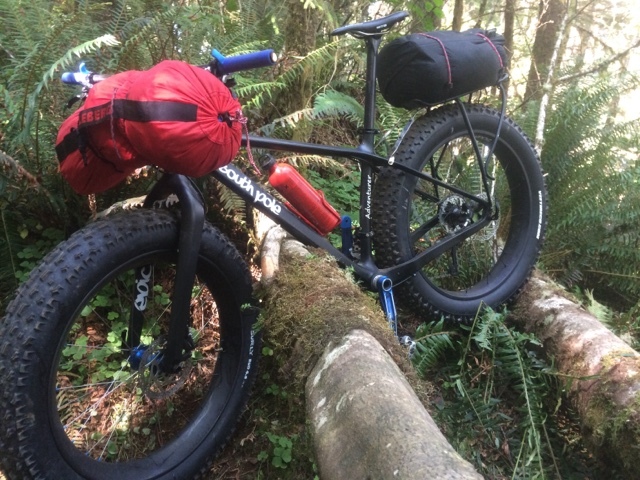 Kind of cool, a guy from New York, working on the Oregon coast and had heard about my South Pole expedition so we took some pictures at the north end of the park which my starting point for riding south. The beach riding was incredible. The beach is littered with dead jelly fish, crab legs and shells and sand dollars. The winds come off the ocean from the north west. So traveling south is generally fast and relatively easy. First obstacle? A military range. They were going to be firing something so they had check points at the north and south ends of the firing range. I was told I could go through, but no stopping and get through fast so you don't get shot. I guess I'm still alive so it must have worked. After about 17 miles, at Seaside, there is a river that enters the ocean. 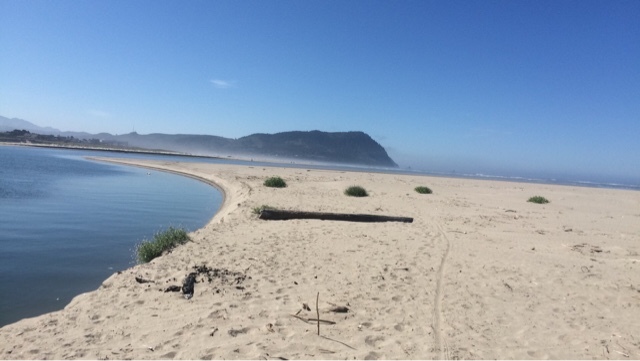 The Oregon coast trail map says to get off the beach and explains how to get around the river. I missed the exit. When I got to the river there was a nice sand bar with seagulls wandering around. The water between didn't look too deep. Can I get to the island and then to the other side? The beach patrol guy thought it might be possible. I headed out into the river. A nice splash splash rhythm followed. Fun, but now my feet are wet and I probably got salty water into the bottom bracket. Arriving on the island and assessing the situation. Yeah, I probably could wade across, but I would be very wet and I would have to float the bike. Finally my senses kick in and I retrace the route back towards the exit I was suppose to take. But wait, a path goes through the weeds up there. It turned out to be a great fun shortcut. Back to the beach for a few miles. Again the map says to leave the beach, but this time it goes on a trail over the point. Cool! I climb the hill to the Ecola? state park and find the trailhead. There is a sign there that has a hiker, a horse rider, and a bike. A faint line goes through the horse and bike. I think two options, bikes are not allowed or it looks like it could be the work of a vandal I pick the second interpretation. The trail is steep, has a lot of root step ups and is nasty for a bike. I meat people that say, all the other bikers give up and turn around. I'm not that smart and keep going. It is a hard climb to work a bike up. A lot of dead fall on the trail makes it even worse. Finally I get to the top. 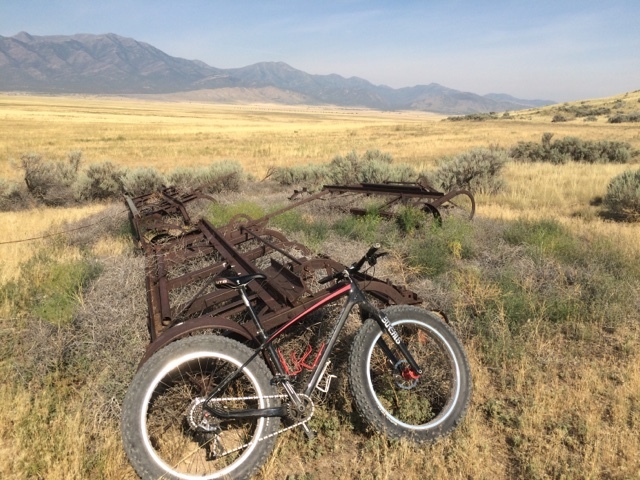 Yes it levels out for a couple of miles, and a mountain bike that is not loaded with gear could ride it, that is assuming the rider isn't hammered from getting up the trail. So after 4 miles of nasty hike a bike I finally get to the hikers camp, and a narrow service road that goes to the trailhead at the south end. I jump on the road. Fast fun downhill in a rainforest. Awesome. Looking back there is a third possibility for the sign. Some biker made the line to warn other bikers that it isn't worth it. At the bottom the trail continues on. This trail does not say anything about bikes and it looks decent. I start on it. It may have been rideable but I'm beat up from the last trail and running low on water so I turn around and use the road to get back to the beach. A lot of climbing on that road for a beat up cyclist. Some more great beach riding. The map says that you need a low tide to get around the next point. It is about mid tide and rising, but a hiker says that it is doable, and it was. 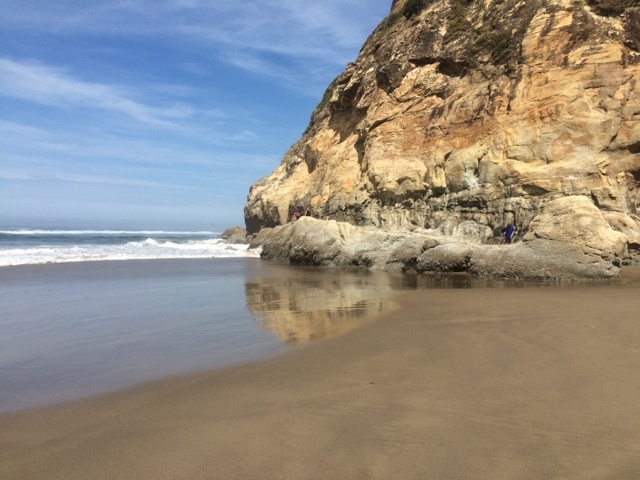 At one point Oregon cut through some of the rocks to make it possible to travel down the beach. I guess this was before highway 101. It is kind of a cool little passage followed by some caves and se areas where the water was surging into the rocks. If I times it well I could go between waves and work my way through the rocks and sand. Next is arch way point. The map says to leave the beach here. I go through the arch, and down the beach until I get to falcon point area. Here there is no way to continue on the beach and I have to climb up a steep trail to get to the road. Then the road goes very steep up to 101. The climb up to the top of falcon point was hard and near the top I drank a Coke. It don't even freeze while I was opening it. The road down to Nahem? Beach, sorry no internet connection here to get the right spelling, is steep and fast. 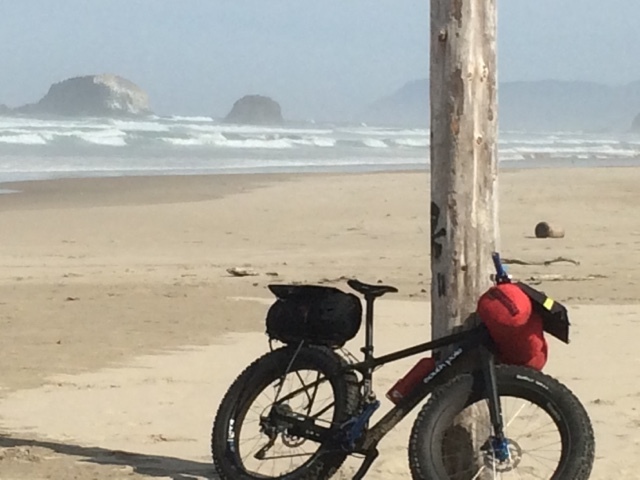 I passed the of road trails for the Oregon coast route. Again not designed for biking. 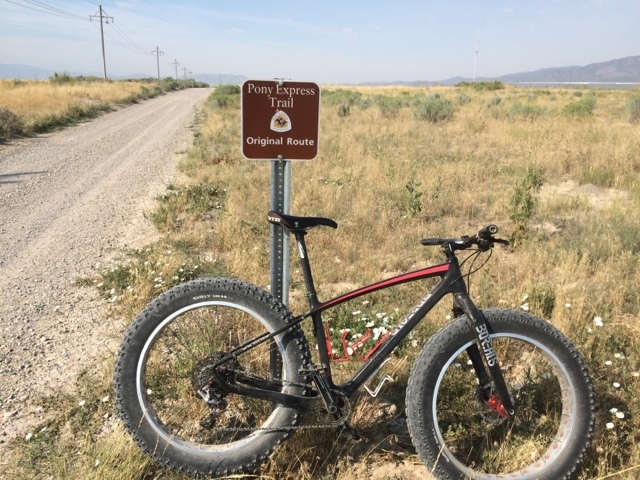 Going down the road I hit the highest speeds I think I have ever done in a fat bike. This flatish tires don't handle well at those speeds. I got to the hiker biker camp just as it was getting dark. It was a great day. However it is a lot different than I hoped. I have come to the conclusion that you need to think of this as a beach and road ride, not the beach and mountain biking trip I was thinking of. So I think I should get back to the truck so I can get the trailer sold as soon as possible. The experiment is done time to be a little responsible. I woke up early this morning so that I could drive from Eagle Mountain Utah to Astoria Oregon where I will begin the my ride. There are so many fires in the western states that it was very smoky all the way until Portland. The final fire was in the wilamina area just outside of Portland. Finally after over 800 miles and 13 hours I was out of the smoke. I don't know what it is about the Oregon coast range mountains. When I reached the Coast Range a smile so large, as Carissa would say, it was so large it would make me have to close my eyes. I think I Oregon just runs in my blood. I was born in Corvallis on the east side of the mountains, but it is more than that. George Luther Boone and Alphonzo (sp?) Boone, my great great something grand parent and father, were some of the original Trailblazers in Oregon and settled in Toledo. George's place is still known as Boone island to this day. They say you can't shake a tree without Boone relatives falling out. I know I have a lot of Boone relatives in this area. I also have some Czech relatives in the area. In particular, Oswego Oregon. I don't know many of my relatives that live here in Oregon. However when my grandma Helen and grandpa Daniel Boone's ashes were sent out to sea I met my Czech relatives. They look just like my Grandma. As I drove through the "rain forest" tears flowed as I remembered sending my grandparents off to their final resting place. But not just for them, but for my mother too. I remember her telling me how much she loved the Oregon rain forest. And when she needed peace she left Utah and moved to the Oregon coast. She was so anxious to move out here that she bought a house that seemed to be falling off the hill and into the ocean. The floor sloped more than any camping spot I have ever placed a tent. I am sure that some day that house will fall off the hill if it isn't torn down first. But my mom loved the house. She loved the forest and the beaches. She would often talk of Cannon Beach, and she loved to go down to Agate Beach to collect agates. I could rarely find an agate but she was a master of finding the agates and other rocks that would be great for polishing. 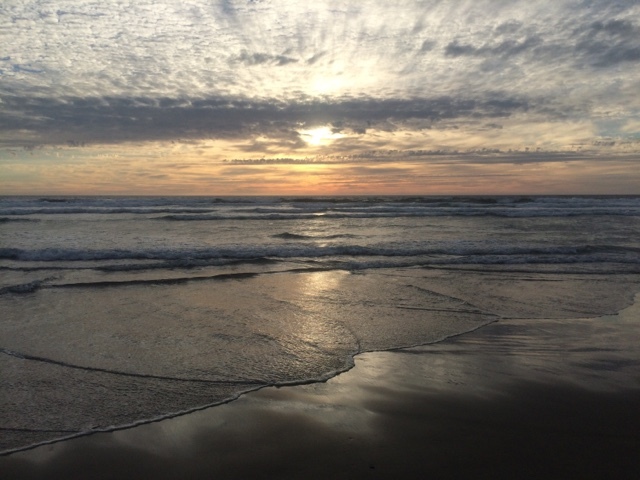 It is hard to imagine that heaven could be as lovely as the Oregon coast. But I am imagine that my mom's heaven is a lot like Oregon, and maybe her home in heaven seems as if it is about to fall into the ocean. I'll take my normal biking gear including some long water proof pants and jacket. For camping I have a 15F sleeping bag and an Easton tent suffers into a compression bag. The tent was given to me by a good friend I first met at the bike store. I have a Nemo pillow, and Exped mattress that I used in Antarctica, also my MSR stove and a Coleman pot, the stove is inside the pot. 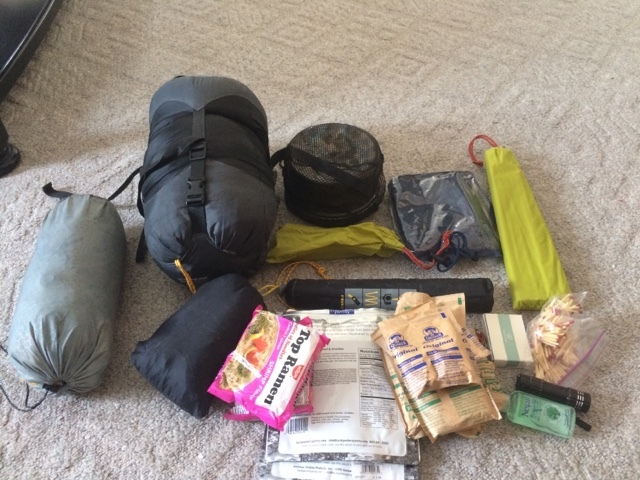 An emergency poncho for rain, some Backpacker's Pantry food, some oatmeal and a Cabela's multi tool. The pliers worked great for handling the hot pot and for wiring gears to spokes in the middle of Antarctica. I have the fuel bottle in the bottle cage on my bike, and the rest of the gear will go in a bag on top of the rear rack and on a bag attached to the handlebars. Then my water and clothes and camera will go in my camelbak. I think I'll use my winter Shimano biking shoes. They should help with the wet conditions. I was planning on being headed to Oregon by now. Originally Jake and I were planning on leaving right after church and driving to Astoria. The problem is it is a 13+ hour drive, and so I would arrive sometime after 3 in the morning. With two drivers this would be possible, but Jake ended up not being able to go this week, and by myself I can't do that drive. So I will get rest tonight and start first thing in the morning. 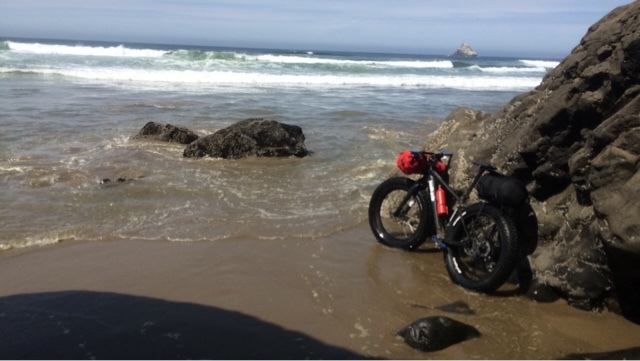 I plan on driving to Astoria Oregon and biking along the Oregon Coast Trail until I run out of time. 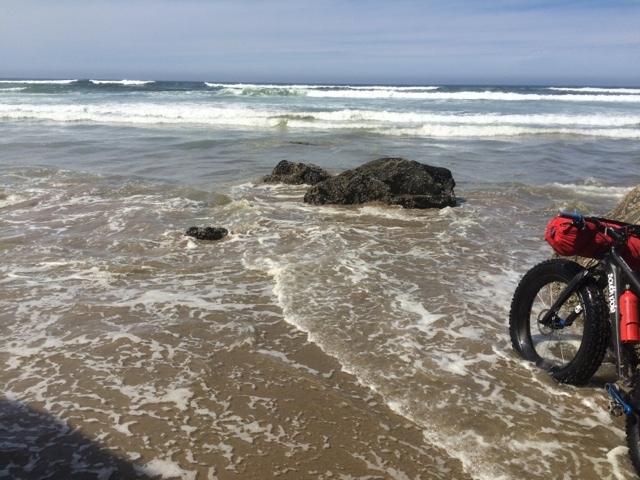 The "trail" consists of riding on the beach as much as possible. Should be fun with my fat bike. The trail also includes some nice trails over areas where there isn't a sandy beach, and to get around rivers I have two options, find a boat that will ferry me to the other side, or jump on the road and go to the nearest bridge. Mostly this is an experimental trip. Assuming it works out decently then we will have to return some day and do the full 400 mile trip from the north end of Oregon to the south. The Bishop must not think I am getting enough exercise on Sundays. We use to go to the building that is a mile from my home. It just seemed that being so close it was not right to drive to church so I would walk. Then a few years ago they moved us across the highway to a church building that is about two miles from home. The neighborhood has a designated horse trail system. I say designated because mostly the trails don't really exist. Such was the case for the trail between my house and the church. The first few weeks I would scamper up and over hills, through brush, and around the empty wash. It was quite an adventure each week, and I would get to church looking like I had been on safari. Eventually I figured out the best route through the gully and built the trail. It is now a pretty nice trail, yet often I still get to church all dusty and dirty. The horse riders enjoy the trail I built and it gets pretty dusty. So today is our first day at a new church building. Actually the building isn't new, President Hinkley dedicated it years ago. However it is the new location for our ward. 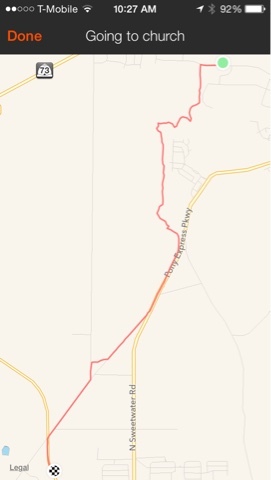 My route this morning ended up being 5.3 miles. I thought about following the old railroad bed that goes through the valley. While it was still visible, and with the fat bike I could go through the fields, it wasn't really a nice route. Looking to the south east I could see a nice dirt road climbing up a hill. OK, a long sleeve shirt and tie are not the best for mountain biking, and wanting not to be too drenched in sweat I had to go easy, but it was a fun little climb with a great view of the valley. 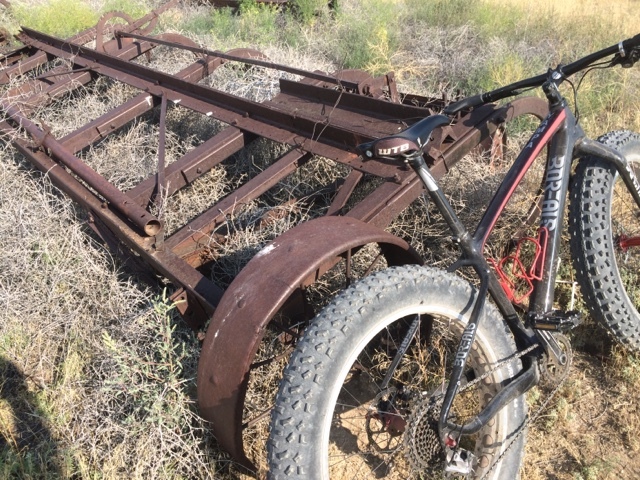 After dropping down the other side of the hills I hit the old Pony Express trail and pretty much followed it the rest of the way to the church. Ironically, in spite of google's efforts to get more sites to be mobile friendly, Blogger does not work well for creating post from a mobile device. So I'll have to fix up the positions of these images when I get home.